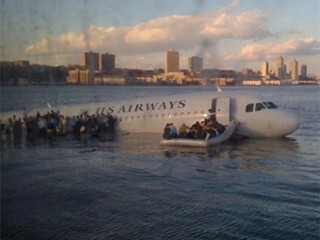 You may have heard about the US Airlines plane that crashed in to the Hudson a bit over an hour ago. Dan actually noticed the roar of the plane as it flew low over us (which is a bit scary). While you don’t want things like that to happen, if it was going to happen it couldn’t have happened in a better place. Passengers are reporting that by the time they had the front doors open on the plane there were NY Waterway ferries waiting for them with their front ramps down. Apparently they were able to walk out of the plane into the ferry. To me that’s absolutely amazing. But it wasn’t just ferries, the NYPD and FDNY are one of the best trained emergency responders anywhere, and they’re equipped for water emergencies with fire boats, police boats, divers, you name it. And there’s the Coast Guard which always trolls the waterways here. The only downside about it happening in New York was how cold it was today – about 20°F when the crash happened. When I got the R32 a year ago I was really psyched. I had waited like 6 months for it and it was in the first batch to arrive in August ’07… My only complaint about the car is that I haven’t gotten to drive it enough – especially this year. I think it was July that we put a whopping 30 miles on it. Nevertheless, we did manage to put about 10,000 miles on it the first year and had a great time with it. Initially I was driving to Norwalk, CT a couple a times a week on the Merritt Parkway, which is a blast with all the curves and whatnot. And on Memorial Day I drove single-handed to Chicago with a stop in Cincinatti both directions. Gas mileage isn’t all that great with it, but with a 3.2L, VR6, 250hp engine you don’t really expect it to be. I get about 24 mpg on the highway driving “comfortably fast”, which isn’t bad in my book. If I slowed down, I’d get better gas mileage, but that’s not why I bought an R32. (Do make sure you have a good radar detector). 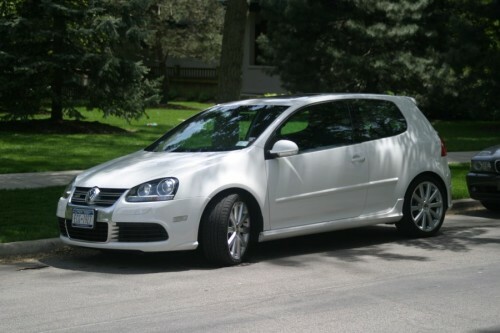 We love the 2008 VW R32 we got back in August. And one of the things we like the most is the nav system. I’ve read reviews that say it’s not the best navigation system, but it does the job pretty well. The most important thing is we never argue about directions… I was raised in a family where the answer to “are we there yet” was to pass you a map and tell you to find where we were, where we were going and calculate the distance and divide by the speed. Dan has improved his navigation skills considerably since we first met, but before the nav system there were still times I’d have to either grab the map and look at it while I was driving, or pull over to look at the map… Now with “Mildred” (the name we’ve given our nav system) – none of that is necessary. You’d think the nav system is completely wonderful, but I’m on a trip right now in Chicago and I gotta say there are times I love the nav system, and times I wish I had a map on me. What you lose with navigation systems is a sense of place and location. With a map you get a big picture and see things in relation to each other. Coming into a new city I feel a bit lost using a nav system to get me around. Sure it does a good job, but I don’t really have a clue where I am, and I miss that. I want to understand the city and the nav system doesn’t do that for me. I tried Google Maps and that helps a little, but for really getting and understanding a big map with lots of information density will beat Google Maps any day.